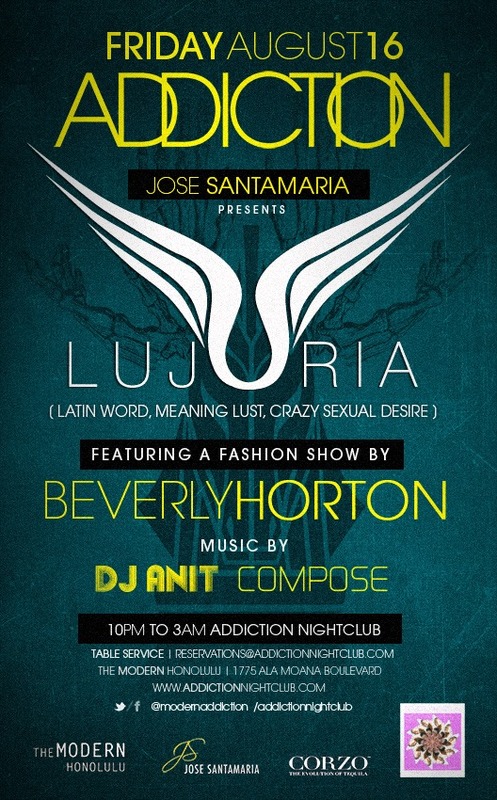 Lujuria, the fashion experience, owned by JS Jose Santamaria enterprises, continues to showcase local, mainland and European designers. On August 16, 2013, at the Modern Honolulu, Addiction Club, Lujuria showcased a Beverly Horton collection and jewelry by Panacea designs. After several years of experience in the New York City luxury retail industry, Horton relocated to Oahu. Her resort wear collection represents Horton’s past and present: the sophistication of NYC, and the vibrant imagery and unique island culture of Hawaii. The design style esthetic combines feminine silhouettes with sophisticated accents and bohemian cool. The collection complements the woman looking for ease, comfort, simplicity and style. Horton’s new collection is composed of three themes: Gentle Nature (floral motifs in a soft colorful palette); Dark Nature (smoky shades of neutral colors); and Southwestern Fusion (sun washed colors infused with tropical and aquatic bright along with tribal prints). The garment silhouettes are easy, and versatile and can be work as a swimsuit cover-up by day, or for a night out on the town, or even as lingerie. To learn more go to beverlyhorton.com and visit the Lujuria – the fashion experience page on Facebook. 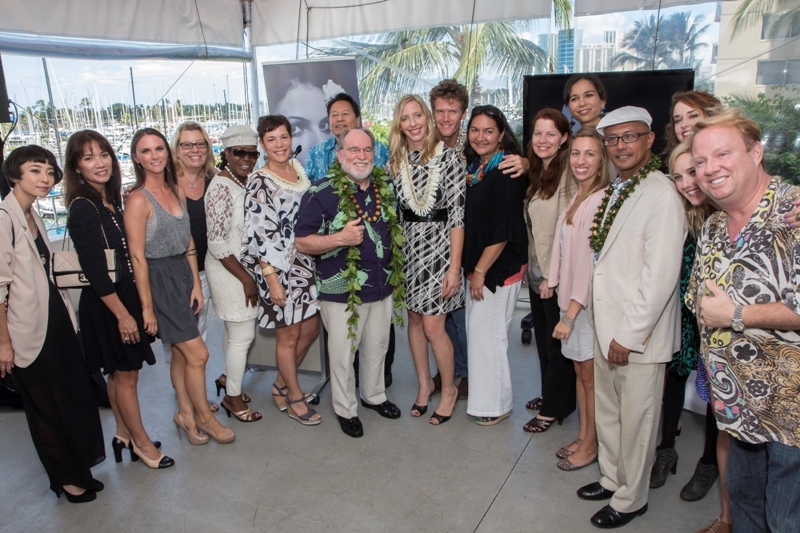 Yesterday, at The Modern Honolulu, Governor Neil Abercrombie proclaimed October as Hawaii Fashion Month (HFM), announcing the launch of the inaugural month-long event to celebrate and promote all aspects of Hawaii’s fashion industry. State Sen. Will Espero led the announcement and was joined by Hawaii Fashion Incubator (Hifi) co-founders, Melissa White and Toby Portner, along with Mary Alice Evans, Senior Director of the State Department of Business, Economic Development and Tourism (DBEDT), who are part of the team spearheading initiative.Hawaii fashion designers, wardrobe, hair and make-up stylists, fashion writers, manufacturers, retailers, artists, educators, business leaders and others were in attendance, filling up the Sun Suite venue. The goal of the month-long initiative is to engage the local community, along with visitors from around the world, to connect with, purchase and learn more about Hawaii fashion. To learn more about opportunities to get involved, and the more than twenty events on the HFM calendar, go to hawaiifashionmonth.com. It was like going back in time, witnessing the epitome of East-meets-West fashion originating from Hawaii. The HI Fashion – Legacy of Alfred Shaheen event on Saturday at Bishop Museum highlighted the work of this innovative, ground-breaking aloha wear designer. 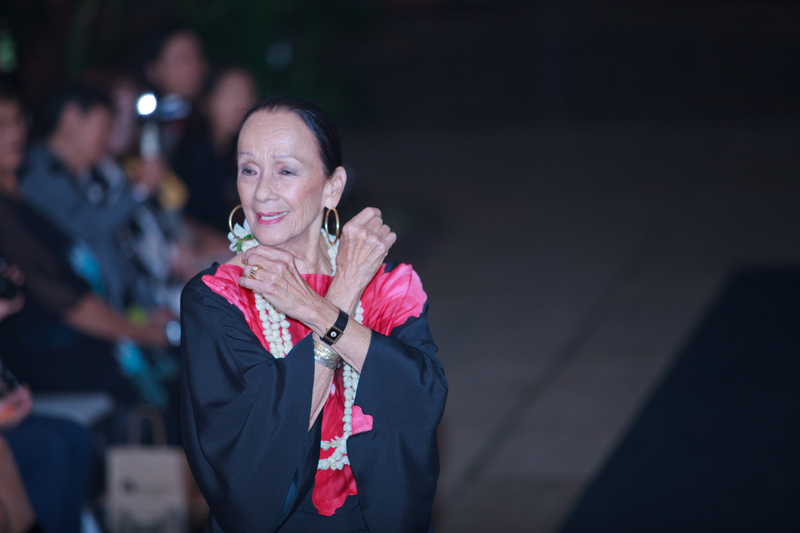 The fashion show paid tribute to Shaheen, the pioneer of aloha wear. A special collection from Reyn Spooner introducing reinterpretations of the original textile designs developed in the 1950s and 1960s opened the show. The second line of the show featured some of Shaheen’s timeless aloha shirts with high-quality fabrics and distinct textile prints. The third line featured some of Shaheen’s exquisite dresses highlighting the classic feminine silhouette. The finale showcased Hawaii’s own Andy South, who unveiled a capsule collection inspired by Shaheen. The regal Beverly Noa, Shaheen’s signature model was at the event and performed a beautiful hula before the fashion show. There was a private blessing and intimate ceremony commemorating the opening of Andy South’s Atelier and business headquarters on September 15, 2012. The invitation was extended to industry professionals to view the workspace at 12 S. King St. The courtyard on the groud floor includes a mini fountain, sitting nooks and trees – all in the middle of China town in Honolulu. The atelier upstairs is breathtaking – with the exposed red brick, prestine wood floors, subtle Asian accents and vintage sewing machines, it’s San Francisco meets New York in a big way. 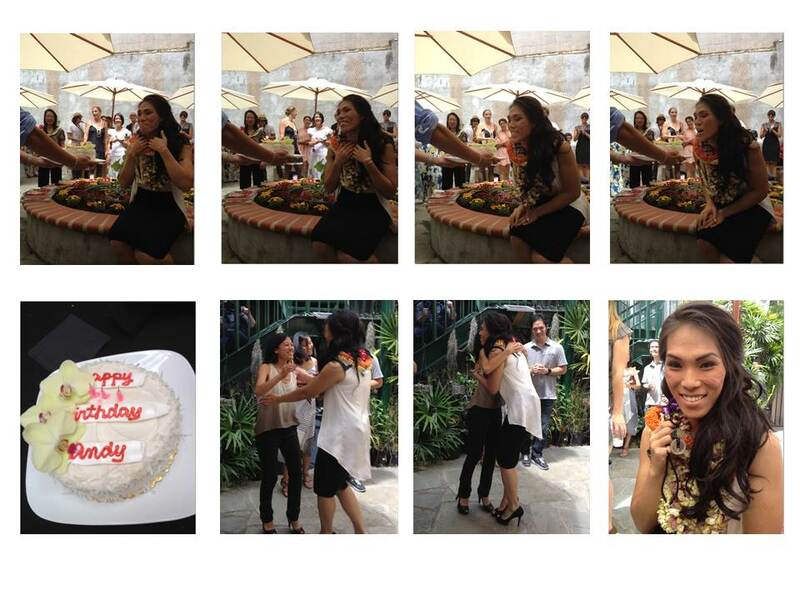 How fitting that this special day also served as an impromptu birthday celebration for Andy South. Andy’s heart lead her back to Hawaii when she could have easily chosen to work anywhere in the world after Project Runway fame and after South by Andy South collections were sold at Neiman Marcus. But Andy chooses to build upon her roots in Hawaii. She mentors her interns, stays true to her asthetic, designs and manufactors her clothing in Hawaii and provides jobs for people in Hawaii. Keep an eye on Andy’s progress as the Atelier continues to produce fantastic Made in Hawaii quality fashions. Visits to the Andy South Atelier are by appointment only. Call (808) 744-1167 or visit info@AndySouth.com. To shop online go to shop.AndySouth.com.